St. John's welcomes and congratulates parents of children who are under the age of 7 years who come for Baptism. We offer a Baptismal Preparation Session the third Sunday of every month after the 11:00am Mass in the Chapel. Parents are required to attend and godparents are encouraged to attend these sessions in order to understand the responsibility they assume when they present their children for the Sacrament. Baptisms are celebrated the first Sunday of each month after the 11:30 a.m. Mass. If your child is over the age of seven and needs to be baptized, please call the Director of Lifelong Faith Formation to inquire about RCIA. The Baptism Ministry welcomes new members to be trained for this delightful service. For further information or to register for the class, please call Misty Huff at St. John the Evangelist office, 637-9650. First Eucharist and First Reconciliation preparation is offered for children in second grade and older. Contact the Lifelong Faith Formation Office for schedule and details. 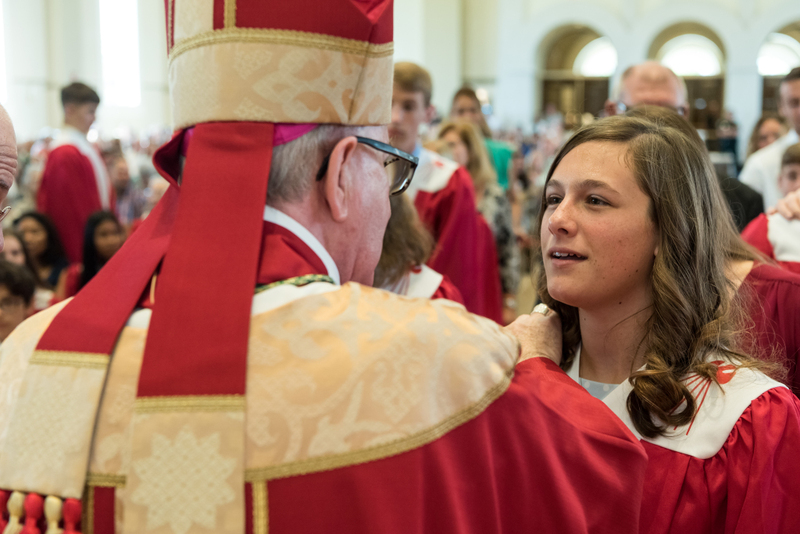 St. John the Evangelist Parish celebrates Confirmation for youth and adults annually. Our preparation process begins in eighth grade for the youth; students receive the Sacrament in the fall of their ninth grade year. Adults should contact the Lifelong Faith Formation Office for details. For more info about our Confirmation program visit www.lifeteenviera.com/confirmation.